Don’t Let Travel Stop Your Fitness – . Work out there ^ but put a towel down first for your own sake! The two reasons you would usually travel. They revolve around either being busy, or purposely being not busy. But wait, you have fitness and health goals. You have been working hard for awhile and don’t want to regress just because of a quick jet out of town. How do I keep the fitness train rolling while travelling? Needless to say the hotel workout is puuuurrrfect for travel! A picture is worth one-thousand words, so a video is basically worth a million. So let’s have a video do the heavy lifting and show you exactly what you are going to be doing. Remember, take as little time as you can between exercises during the round. After each round you can take a breather and get a quick drink before you begin again. Try to make those no more than 20–30 seconds. 20 minutes out of your day and a killer workout that will get you feeling great and pumped that you didn’t skip. 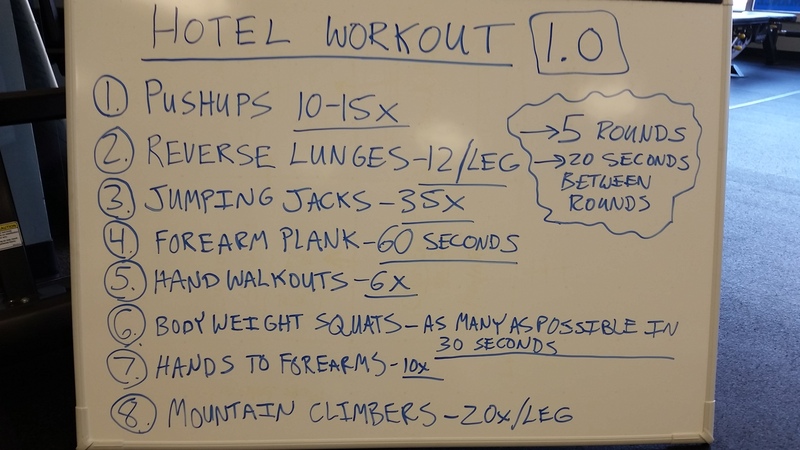 Warning: Sweat may fly during hotel workout. If you need an alternative to one of the exercises, let me know and I’ll shoot one to you. Pingback: Are You Vacationing Wrong? – . Pingback: Do You Give Excuses or Reasons? – .